Another one of the most anticipated movies of the fall. An homage to the beloved original is going to be almost too irresistible for horror fans and cinephiles to pass up. Wipes the slate clean of all Halloween movies, other than the John Carpenter original, and pays off what fans have wanted one last look at - Laurie vs. Michael. David Gordon Green’s film amps up the carnage, has some terrific technical proficiency, and has a great Jamie Lee Curtis performance, when the movie commits to it. For me, and perhaps only me, this hyper-violent Halloween film misses the mark on all the elements that made the original source film so special. When you get down to the nuts and bolts of the story, and specifically Laurie Strode’s ultimate plans, the movie fails to make much sense. The elements which work well do not appear frequently enough, and the opportunity to make the film suspenseful and white-knuckle terrifying are squandered for excessive violence and middling comedy. Ever been in a room with a group of people and someone shares a joke or funny story and when the punchline is delivered, the room erupts in jubilation, and you kinda fake your reaction because you either didn’t find the thing very funny or didn’t quite understand what all the hullabaloo was about? Directed and co-written by David Gordon Green, this version of Halloween is everything the original film is not: Messy, tonally imbalanced, gratuitous in its violence, and as dumb as a box of hammers. A hammer, incidentally, one convenient object Michael uses to bash in an unsuspecting woman’s skull in her own kitchen. But perhaps I’ve said too much. Green’s script, written with Danny McBride and Jeff Fradley, fails, or is not really interested in, deciding what direction this movie should go in. Should we make it an homage to the original? Shall we modernize the story and bring it forward to a 2018 audience? Should we keep it intense and play with mood and the anticipation of what may or may not happen, or just go with full violence and telegraph almost everything you see play out? Shall we make this humorous or put kids in peril? The decision to say “Yes” to all of those options creates a film that is simply a slapdash of moments, which fail to lead to anything other than, again, the reason we are really all here. Your main event of the evening: Strode v. Myers II. The story, in scattershot moments, shows at least some of the concepts Green has crafted could work quite well. At other times, the plot makes no sense, giving us a careening, rudderless viewing experience. We begin with two podcasters (Rhian Rees, Jefferson Hall) who are attempting to find Laurie Strode (Jamie Lee Curtis) on the cusp of the 40th anniversary of the Haddonfield, Illinois killings depicted in the Carpenter film. Rebuffed in a matter of moments by Strode, they move on to a meeting with Myers himself, incarcerated in a mental health facility and tended to by Dr. Sartain (Haluk Bilginer). Trying to entice Myers to speak for the first time since the Haddonfield murders, the podcasters unveil his legendary mask, creating something of a supernatural event, leading to a series of fateful encounters, even if he doesn’t utter a peep. We learn that orders have been given to move Myers and a number of patients to a new facility on, wait for it, the evening prior to the 40th anniversary of the murders. And before you can say, “What could possibly go wrong?”, a number of individuals meet an unseemly demise and Myers is loose, looking for his mask and ready to butcher and maim anyone standing in his way. On the flipside, Strode is nearly 60 years old, something of a recluse and in an acrimonious relationship with daughter Karen (Judy Greer). She maintains something of a secret relationship with her high-school aged granddaughter, Allyson (Andi Matichak), who is attempting to find ways to repair her broken family. As we observe Strode’s old farmhouse, retrofitted into an eventual destination for the death match we all know is coming, Myers is unleashed. As the body count rises, and the violence becomes more and more graphic, Halloween quickly grows tiresome and repetitive. Carpenter’s magic is absent, Green unable to generate palpable mystery and fear of the unknown, or the pulse-pounding tension. 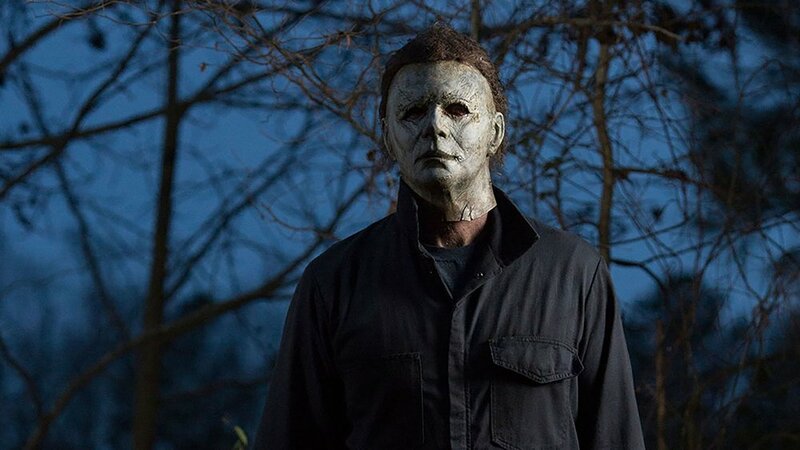 Even though some nifty remixing of the film’s iconic score keeps things humming, Myers is little more than a video game villain, doling out cruel, cartoonish brutality with no rhyme or reason. And if that’s what you want after 40 years, cool. Enjoy it. Many have pointed out that the movie takes a long hard look at grief and trauma, and have praised Curtis for conveying that pain and anguish in a moving and affecting way. And she does. For a bit. The Final Battle in the Cabin in the Woods. Anecdotally, the film has moments of humor that work well, but the film also fails the logic test. When one actually steps back and looks at the film’s third act, well, there are questions to be asked the movie could care less in answering. I won’t spoil anything, but I would love to hear someone explain the practicality of a particular bunker, the rationale behind the use of locking zones, and a final sequence that somehow both finishes the story once and for all, effectively and satisfyingly I might add, only to then insult the audience by doubling down on, yes, the possibility of a sequel. I know people who love Halloween 2018, and I wish I was among them. I was thrilled at the prospects of letting David Gordon Green create a movie, in the spirit of the original, yet stay connected to the very things which make great horror and suspense work so well in today’s cinematic landscape. Instead, we get something jumbled, messy, and illogical. Others are happy to overlook those realities. Unfortunately, count me out. I tried you guys. I just can’t. Starring: Jamie Lee Curtis, Judy Greer, Andi Matichak, James Jude Courtney, Nick Castle, Haluk Bilginer, Will Patton, Rhian Rees, Jefferson Hall, Virginia Gardner, Dylan Arnold, Miles Robbins, Jibrail Nantambu, Omar J. Dorsey. Copyright © Should I See It 2018.